Heat oven to 350°F. 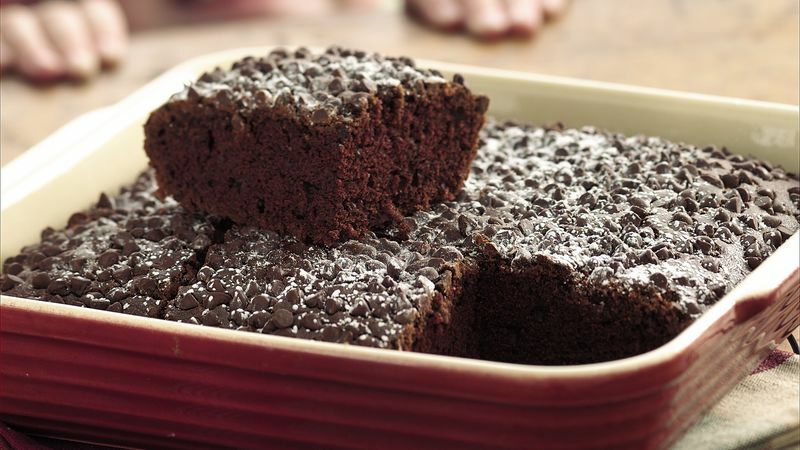 In ungreased 9x5-inch loaf pan, mix flour, brown sugar, cocoa, baking soda and salt with fork. Stir in remaining ingredients except chocolate chips and powdered sugar. Sprinkle chocolate chips over batter. Bake 25 to 30 minutes or until toothpick inserted in center comes out clean. Cool in pan on cooling rack 30 minutes. Sprinkle with powdered sugar. This one-pan cake takes the work out of baking and adds back the fun. Since it makes more than you may need at one time, keep it stored in an airtight container at room temperature for up to three days or freeze for up to three months.